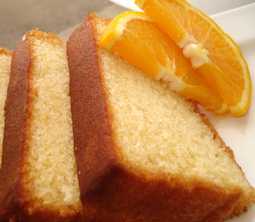 Orange Sour Cream Cake - A recipe from Savor California, the online showcase for extraordinary gourmet foods and beverages from California. Sift flour, baking powder, baking soda, and salt in a mixing bowl and set aside. In a electric mixing bowl with a whisk attachment, beat egg whites on high speed until the peak forms. Transfer the fluffy whites into a bowl and set side. In a same bowl with a paddle attachment, cream butter and sugar until creamy. Add egg yolks, sour cream and orange zest and beat until light and fluffy on medium speed. Add the flour to the mixture and mix until combined on low speed. Fold in the reserved egg whites to the mixture until just combined. Pour the batter into a greased and floured bundt pan. Bake for 45-55 minutes until toothpick comes out clean. Let the cake rest in the pan for 15 minutes. Turn out the cake to a serving platter and poke holes with a wooden skewer. Spoon the orange sauce over the cake when you serve. Mix the ingredients in a sauce pan and bring to to gentle boil over medium heat. cook the sauce for 3-4 minutes. Remove from the heat and let it cool for 10 minutes to thicken slightly. Pour the sauce over the cake.